Ph.D. in Pathology is a 3-year doctorate degree program, the minimum eligibility is master degree in Pathology from a recognized college or university or its equivalent exam. The average tuition fee charged for Ph.D. in Pathology course in India ranges between INR 1,000 to 2 lacs, for a span of 3 years. Ph.D. in Pathology is the study and investigation of disease, integrates all parts of biomedical science to further the comprehension and understanding of disease processes and create methods for diagnosis, prevention, and treatment of disease. Admission to Ph.D. in Pathology depends upon applicant's performance in a relevant entrance exam and resulting round of counseling. Ph.D. in Pathology offers a wide range of research opportunities for our students. Pathologists may work in clinical laboratories and hospitals, aiding physicians in patient diagnosis. They may find employment in academic institutions, teaching pathology fundamentals to students and trainees within the academic departments of genetics, toxicology of biochemistry. Investigative pathologists use laboratory research and experimentation to gain insight into the treatment and function of various diseases. The most commonly researched diseases in this field include Lyme disease, cancer, neurological trauma, hypertension, and tuberculosis. Such postgraduates are hired in capacities such as Professor, Pathologist, Marketing Executive - Pathology Services, Sales Executive/Manager, and BDM - Pathology Testing, Professor - Oral Surgery, Oral Surgeon Consultant, Research Associate - Oral Drug Delivery etc. The average salary of the candidates in this field is INR 6,50,000. Top Recruiting Companies Apollo Hospital, National Institute of Health, Armed Forces Institute of Pathology, Dr. Lal Path Labs, Asian Institute of Medical Sciences, etc. Top Job Areas Government or Private Hospitals, Medical Colleges, Private clinics, Medical and Research Labs, ETc. Top Job Positions Professor, Pathologist, Marketing Executive - Pathology Services, Sales Executive/Manager and BDM - Pathology Testing, Professor - Oral Surgery, Oral Surgeon Consultant, Research Associate - Oral Drug Delivery etc. Ph.D. in Pathology: What is it all about? Ph.D. in Pathology is Doctorate Pathology course. Pathology is the study of diseases which integrates all aspects of biomedical science to further the understanding of disease processes and develop methods for diagnosis, prevention, and treatment of disease. The doctoral program is comprehensively based and offers research training in both essential and clinical examinations of sickness and disease, and encourages candidates to incorporate the two regions that are appropriate in their doctoral research. Students are expected to fulfill all course requirements, choose a dissertation laboratory, and begin preparatory dissertation research within four semesters. Candidates in the elective tracks take after altered educational modules in which certain departmental needs are substituted by prerequisites of the individual interdepartmental program. The Ph.D. in Pathology provides a decent understanding of the molecular premise of disease, the key components of cell development and separation. Sub-specialized research interests in the areas of cancer biology, stem cell biology and microbial and viral pathogenesis. Ph.D. in Pathology course will afford the candidate with the adaptability of fitting a course of concentrate towards particular research interests and objectives and prepare the candidate for a career in propelled and advanced academia or positions in industry. Post Graduate degree in relevant subject or equivalent with a minimum of 50% marks in aggregate. Candidate will have to clear the common entrance examination conducted by the University for the Course. Some Institutes prefer score of NET (National Eligibility Test) and is administered by the University Grants Commission (UGC) for most subjects, with the exception of Science and Engineering which are covered by CSIR (Council of Scientific and Industrial Research). 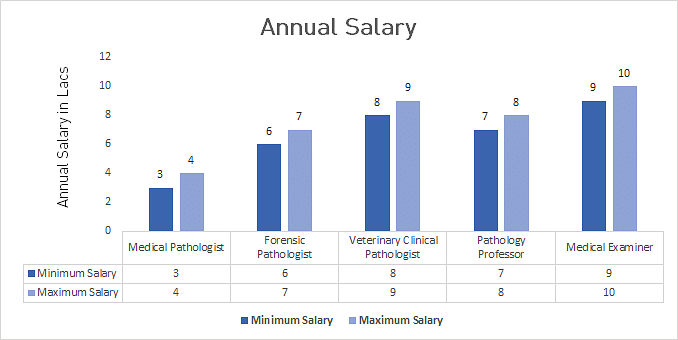 Career opportunities in the field of pathology abound since there are multiple specialties in pathology, and a postgraduate can choose to specialize in any of the areas such as histopathology, cytopathology, clinical pathology, and work under the supervision of some of the best pathologists. Successful postgraduates of the discipline work as Specialists in any of the sub-branches of pathology such as surgical pathology, clinical pathology, anatomical pathology, veterinary pathology, molecular pathology, plant pathology and forensic pathology. They may also choose to work as consultants to doctors or medical examiners. Employment opportunities for experienced professionals in this field are also open in Universities, laboratories, and hospitals. They are employed in areas of public health, law enforcement, government agencies, among other fields.